Von Hippel-Lindau (VHL) disease is an autosomal dominant inherited cancer syndrome, and VHL is identified as a tumor suppressor gene. The main objective of this study was to identify disease-causing mutations in a Chinese family affected with VHL disease. Genomic DNA was extracted from peripheral blood from a Chinese family with VHL. A predicted pathogenic variant was identified by targeted exome capture technology and next-generation sequencing. A novel heterozygous mutation (c.349 T > A, p.W117R) was detected in affected family members. No mutation was detected in unaffected family members or in the 150 normal controls. The mutation segregated with the disease phenotype throughout three generations. Histopathological examination revealed the characteristics of hemangioblastoma. A novel W117R was detected in the VHL gene that caused retinal hemangioblastomas in affected members of a Chinese family. VHL disease is an autosomal dominant inherited cancer syndrome, including brain and retinal hemangioblastomas, spinal hemangioblastomas, renal carcinomas, pancreatic cancers, and pheochromocytomas. VHL is identified as a tumor suppressor gene, which has three exons encoding the VHL protein (pVHL). Germline mutation of the VHL gene is the leading cause of the disease. VHL gene is highly conserved across species and is located on the short arm of chromosome 3, 3p25-26 . The mutant allele in most VHL patients is inherited from an affected parent. Missense mutations and nonsense mutations are the most common. Somatic mutation cases with homozygous inactivation of the VHL alleles are tumorigenic . The incidence of the disease is about 1/36000 live births per year with high penetrance (> 90%) before 65 years of age [1, 3]. Of all VHL patients, up to 85% develop retinal hemangioblastomas, whereas tractional retinal detachment with proliferated epiretinal membranes (ERM) is detected in 9% patients . It is very difficult to treat optic nerve hemangioblastomas, which usually leads to poor visual prognosis. Mutations in the VHL gene inactivate the VHL protein and induces excessive vascular endothelial growth factor (VEGF), which promotes blood vessels to proliferate and to form retina hemangioblastomas in nonhypoxic conditions . Many VHL patients, commonly younger than 50 years of age without routine screening surveys, die of renal cell carcinomas and central nervous system hemangioblastomas . Retinal hemangioblastomas, usually noted in the temporal peripheral region of the retina, are often the earliest presentation of VHL patients in their mid-twenties . Herein, we summarize the clinical, histological and genetic data of a VHL Chinese family and identify a novel heterozygous mutation in the VHL gene. A Chinese family from southern China showed an autosomal dominant inheritance pattern for VHL (Fig. 1) that affected 3 of the 7 living family members. Medical and ophthalmic histories were obtained, and ophthalmological examinations were performed. All procedures were performed according to the guidelines of the Declaration of Helsinki for research involving human subjects, and were approved by the Ethics Committee of Chinese PLA General Hospital. Informed written consent comprised DNA extraction, gene analysis and ophthalmological examinations. 150 normal controls were used in the study. Written informed consent was obtained from all participants, while the consent of the 6-year-old and 12-year-old patients was signed by their father. Genomic DNA was extracted from peripheral blood using a DNA extraction kit (TIANGEN, Beijing, China) according to the manufacturer’s instructions. DNA was purified and quantified using a Nanodrop 2000 spectrophotometer (Thermal Fisher Scientific, DE). DNA fragments with sizes ranging from 350 bp to 450 bp and those including the adapter sequences were selected for the DNA libraries. The coding regions of 381 genes associated with retinal diseases were captured using the GenCap custom enrichment kit (MyGenostics, Beijing, China). Genomic DNA was fragmented and mixed with GenCap probe (MyGenostics, Beijing) for PCR and hybridization as previously described . PCR products were purified using SPRI beads (Beckman Coulter, Brea, CA, USA), according to the protocol. The enriched libraries were sequenced using an Illumina Nextseq 500 sequencer (Illumina, San Diego, CA, USA) for paired-end reads of 150 bp. All mutations identified by Nextseq 500 sequencing were confirmed by PCR. The DNA samples were amplified with the forward primer 5′- CTGACCTCATGATCCGCCT-3′ and the reverse primer 5′- GGTCTATCCTGTACTTACCACAA-3′ (292 bp, VHL exon2 chr3:10188086-10188378). Genomic DNA from all available family members were obtained for PCR and next-generation sequencing (NGS). Sites of variation were identified through a comparison of DNA sequences with the corresponding GenBank (www.ncbi.nlm.nih.gov) reference sequences. Following sequencing, raw image files were processed using Bcl2Fastq software(Bcl2Fastq 2.18.0.12, Illumina, Inc.) for base calling and raw data generation. Low-quality variations were filtered out using a quality score ≥ 20. Short Oligonucleotide Analysis Package (SOAP) aligner software (SOAP2.21; soap.genomics.org.cn/soapsnp.html) was then used to align the clean reads to the reference human genome (hg19). Polymerase chain reaction (PCR) duplicates were removed using the Picard program. Subsequently, single nucleotide polymorphisms (SNPs) were determined using the SOAPsnp program, reads were realigned using Burrows-Wheeler Aligner software 0.7.15, and the deletions and insertions (InDels) were detected using Genome Analysis Toolkit software 3.7. The identified SNPs and InDels were annotated using the Exome-assistant program (https://bmcgenomics.biomedcentral.com/articles/10.1186/1471-2164-13-692). MagicViewer was used to view the short read alignment, and confirm the candidate SNPs and InDels. Non-synonymous variants were evaluated using the four algorithms, PolyPhen (http://genetics.bwh.harvard.edu/pph2/), Sorting Intolerant From Tolerant [SIFT; (http://sift.jcvi.org/)], Protein Analysis Through Evolutionary Relationships (PANTHER; www.pantherdb.org) and Pathogenic Mutation Prediction (Pmut; http://mmb.pcb.ub.es/PMut/) to predict pathogenicity. The Human Gene Mutation Database (HGMD) is used to confirm the novelty of the variant (http://www.hgmd.cf.ac.uk/ac/index.php). The 32-year-old female attended the outpatient clinic of our hospital in June 2017. She complained of blurred vision for the past 2 years in her left eye. The patient had previously undergone the operation for cerebellar hemangioblastoma 3 years ago. Family history revealed that the patient’s mother had blindness in one eye and died of renal carcinoma. Upon initial examination, the patient’s BCVA was NLP OD and 0.04 OS. Her intraocular pressure was 39 mmHg OD and 17 mmHg OS. Fundus examinations showed several retinal hemangioblastomas in the temporal area of the left eye. Retinal traction detachment was noted due to the formation of proliferative membranes connected to the hemangioblastomas (Fig. 2). 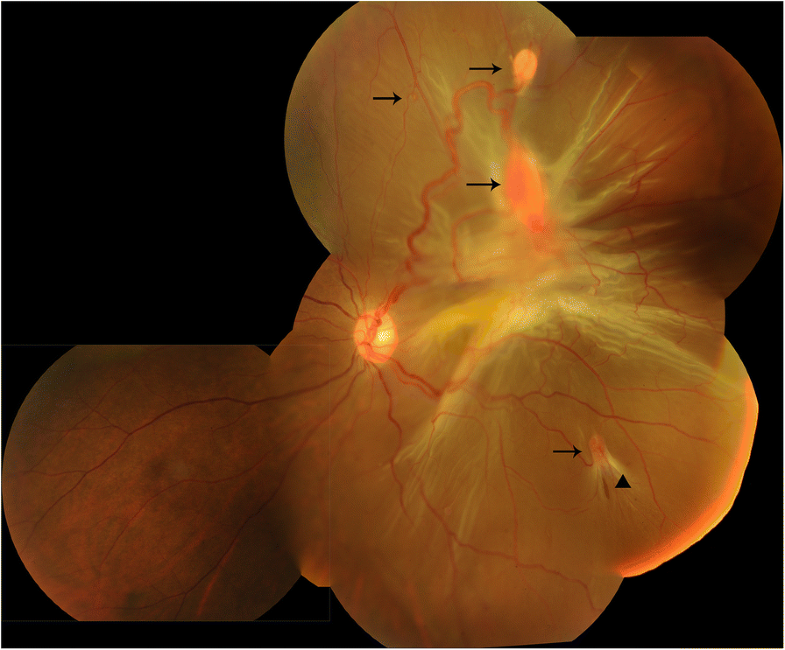 Because of a complicating cataract, the fundus was not visible in the right eye, and B ultrasound scan showed proliferative vitreoretinopathy. She underwent PPV, hemangioblastoma resectomy and oil temponade in the left eye. BCVA improved to 0.2 OS postoperatively. The asymptomatic 6-year-old son of the proband had a visual acuity of 1.0 in both eyes. Fundus examination revealed a very small hemangioblastoma in the distant peripheral retina of his right eye, while his left eye was normal. The 12-year-old daughter of the proband complained of a curtain coming across the vision in her left eye during the screening examination. Her BCVA was 1.0 OD and 0.8 OS. Fundus examinations revealed a small hemangioblastoma in the infratemporal region of the peripheral retina in her right eye. 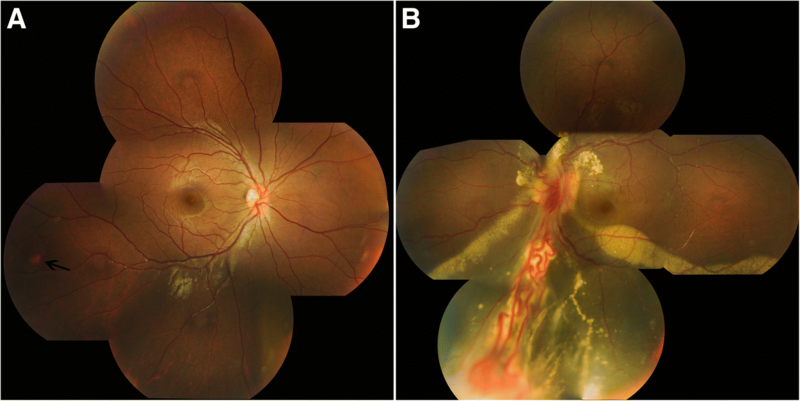 A sizeable hemangioblastoma with 2.5 papilla diameters and prominant feeder vessels were detected in the inferior peripheral retina of her left eye, fractional retinal detachment was demonstrated with fibrovascular proliferation (Fig. 3a-b). The mother of the proband has passed away. She had blindness in one eye and died of renal carcinoma, so she was supposed to be the variant based on her medical history. Normal hematoxylin-eosin stain of the excised specimen from the proband showed abundant stromal cells packed with vascular channels. Immunohistochemically, the specimen was positive for CD31, CD34 and NSE. The coding regions of 381 gene complicated in heritable retinal disease were captured and sequenced by NGS and PCR using genomic DNA from the proband (II:1). PCR was used to confirm the variation (292 bp, VHL exon2 chr3:10188086-10,188,378). The coverage statistics are showed in Table 1. I:2 has passed away, so her gene analysis was not available. DNA sequencing revealed the 3 living affected members (II:1, III:1, III:2) in the family harbored a novel heterozygous missense mutation. The nucleotide transversion (c.349 T > A) within exon 2 in VHL gene resulted in a change of tryptophan to arginine (W117R). Tryptophan is non-polar aromatic, and when substituted by arginine, it can damage the stability of the protein. None of the 4 unaffected individuals (I:1, II:2, II:3, II:5) and the 150 normal controls have this mutation in VHL gene. The mutation consegregated with the disease phenotype. W117R variant would be classified as “likely pathogenic” (PM2, PM5, PP1, PP3, PP4) using American College of Medical Genetics and Genomics (ACMG) criteria. VHL disease mostly manifests with cerebellar or retinal hemangioblastomas. The second most common feature is renal cell carcinoma. Germline VHL mutations induce different phenotypes of cancer . Truncating mutations and large deletions are most commonly associated with the phenotype of renal carcinoma, type I. Missense mutations are commonly associated with in the phenotypes of pheochromocytoma alone or accompanied with renal carcinoma, type II. Genetic testing can allow for discontinuation of surveillance for family members without VHL gene mutations. About 60% of VHL patients deny a family history, suggesting a high frequency of novel mutations in the VHL gene [9, 10]. VHL disease was identified in this family because of ocular findings and gene analysis. Retinal hemangioblastomas are an important ocular manifestation of VHL, ranging from very small capillary abnormalities to large lesions that cause tractional retinal detachment. Initially, a small hemangioblastoma presents as a red dot with a diameter of hundred microns, then develops into a large nodule with a distinctive clinical appearance . Small lesions are easily to be treated by photocoagulation. Transscleral cryotherapy is used to treat the larger lesions in the extreme periphery of the retina. Large lesions (> 1.5 mm in diameter) are often difficult to treat by laser photocoagulation or cryotherapy. Vitrectomy is performed in patients with tractional retinal detachment or severe vitreous hemorrhage. Peripheral large lesions can be excised during an operation, but this approach is not appropriate for lesions adjacent to the optic disc. Optic nerve hemangioblastomas grow slowly, and visual acuity deteriorates with hard exudates, macular pucker, and epiretinal membranes. Anti-VEGF therapeutic approaches have been developed in recent years. The increased expression of VEGF mRNA appears to correlate with retinal tumor formation . In pVHL-defective cells, leads to hypoxia-inducible factor (HIF) cannot be degradated. The excessive accumulation of HIF protein hypoxia and the up-regulation of hypoxia-induced genes, including erythropoietin (Epo), VEGF, transforming growth factor (TGF), and platelet-derived growth factor (PDGF) . HIF also activates NF-κB and cyclin A, producing many growth factors and cytokines, and the release epidermal growth factor (EGF) and fibroblast growth factor (FGF) . Therefore, anti-VEGF alone is not sufficient to treat ocular lesions in VHL patients. The intravitreal injection of anti-VEGF drugs does not alter the size of hemangioblastoma, but decreases retinal exudates and macular edema in some patients [13–15]. 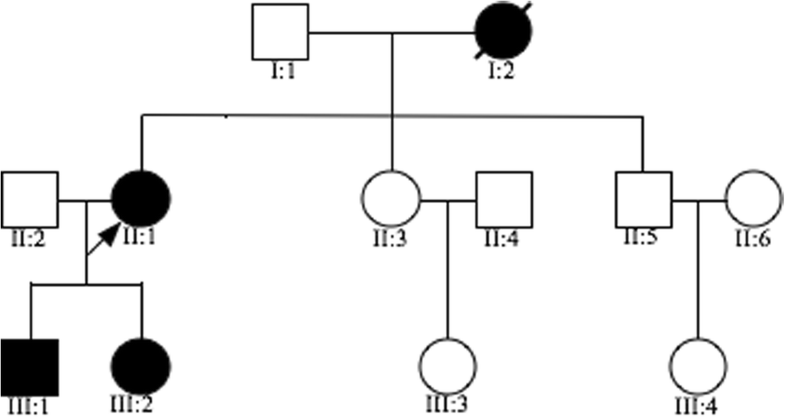 The novel W117R mutation identified in the VHL gene of this Chinese family was detected in 3 affected individuals but was not detected in 4 unaffected members. These findings support the hypothesis that the W117R mutation causes VHL disease in the patients. The mutation exhibited 100% penetrance in this family, even in young children. pVHL binds to hypoxia-inducible factor (HIF). The ubiquitination of HIF by the β-domain of amino acids pVHL (63-155) plays a key role in the cellular adaptive response to changes in oxygen availability. The hydroxyproline of HIF inserts into a gap in the pVHL hydrophobic core, which is a hotspot of tumorigenic VHL mutations . The tryptophan at amino acid position 117 lies in the pVHL hydrophobic core, and plays a central role in stabilizing pVHL. In our study, tryptophan is substituted by Arginine at 117 codon, which destroys the hydrophobic core and changes the protein tertiary structure. According to previous studies of the pVHL-HIF1α complex, mutations of Trp117, Ser111, and Tyr98 of pVHL interfere with binding of HIF-1α to pVHL . Therefore, the W117R mutation is expected to abolish the ability of pVHL to bind HIF, is the leading cause of VHL disease in this Chinese family. In conclusion, we have identified a novel heterozygous mutation in the VHL gene (c.349 T > A, p.W117R) of a Chinese family, which broadens the spectrum of VHL gene mutations in Chinese patients. Xing Wu and Lanlan Chen contributed equally to this work. The authors are grateful to all family members for their participation in this study. This study was supported by Hainan Natural Science Foundation (NO. 817347). The data supporting the conclusions of this article are contained within the manuscript. All raw data used during the current study available from the corresponding author on reasonable request. XW and LC carried out the analysis of data and drafting the manuscript. YZ and HX participated in the analysis and interpretation of data. MX and YW carried out the acquisition of data. HH made substantial contributions to conception and design of the study and revising the manuscript. All authors have read and approved the final version of the manuscript. This study was approved by the Institutional Review Board and the Ethics Committee of Chinese PLA General Hospital. Informed written consent comprised DNA extraction, gene analysis and ophthalmological examinations. 150 normal controls were used in the study. Written informed consent was obtained from all participants, while the consent of the 6-year-old and 12-year-old patients was signed by their father. Written informed consent was obtained from all patients to publish their cases in this study.